Any anti-aging skincare routine must include the daily application of a broad spectrum sunscreen rated SPF 30 or greater. It is the #1 anti-wrinkle, anti-dark spot, anti-sagging product you can use—and you should be using it every day, even if the sun isn’t shining. The best sunscreens also include a potent, effective array of antioxidants, skin-restoring ingredients, and hydrating ingredients appropriate for your skin type. That way, you only need one morning moisturizer, not two. At Paula’s Choice Skincare, we take using sunscreen very seriously and have formulated many options loaded with extra beneficial ingredients so you can choose the best one for your skin type! The best anti-aging skincare routines includes perfectly formulated cleansers, toners, exfoliants, serums, eye creams and moisturizers. These are all vitally important for younger, healthy-looking skin BUT none of these products replaces the need for daily sun protection. The benefits these products provide just won’t work the way you want without the sun protection step. We can’t stress this enough: Don’t forget daily sunscreen or your skin will suffer the consequences! Sunscreen use is needed 365 days of year because the sun isn’t just damaging your skin when the sky is clear. The UV light emitted by the sun steadily and silently hammers away at skin year-round whether it’s cloudy or raining. Leaving your skin unprotected against this assault results in all the signs of aging you want to avoid—and you won’t feel the damage taking place! What if you already have wrinkles and dark spots from years of unprotected sun exposure? Research has shown that it’s never too late to start protecting your skin. In fact, people with sun damaged skin (and that includes all of us) who started using a broad spectrum sunscreen later in life saw a noticeable reduction in every visible sign of aging. 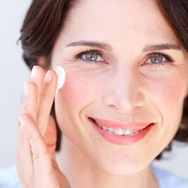 No matter your age, daily sunscreen use is the foundation of a brilliant anti-aging skincare routine. See our article “How to Put Together a Skincare Routine” to learn about how sunscreen works with other anti-aging products to improve your skin. • Any sunscreen you choose should be labeled broad spectrum, meaning it protects skin from the sun’s damaging UVA and UVB rays; UVA rays are present all day long, year-round, and, unlike UVB rays that cause sunburn, you don’t feel UVA damaging skin. • If you think you don’t need sunscreen because you spend most days indoors, consider this: UVA rays penetrate windows and can harm your skin even if you’re in your home, car, or office. Sun damage begins the first minute your skin sees daylight, even if it’s cloudy outside. • Only purchase sunscreen rated SPF 30 or greater. That is the minimum rating recommended by most dermatologists and medical boards worldwide. • Apply sunscreen liberally to the face, neck, and chest area, if it will be exposed to daylight. Spread a layer you can see, and then massage it into the skin. Allow a few minutes for it to absorb before applying makeup. • For the face, you don’t need to use a “beach” sunscreen; instead, look for a facial moisturizer with built-in sun protection, which provides hydration and a mix of beneficial anti-aging ingredients. • Choose a facial moisturizer with sunscreen based on your skin type: If you have dry skin, look for a cream; oily skin, look for a gel or fluid sunscreen; combination skin, look for a gel or lotion texture. • Antioxidants are a sunscreen’s perfect partner: They work with the sunscreen ingredients to further defend skin from environmental assault. Superstar antioxidants to look for in sunscreens include various forms of vitamins C and E, green tea, soy, grape, and pomegranate, among others. • Sunscreen is always the last skincare product you apply during your morning routine. Applying other skincare products over sunscreen will dilute its effectiveness. • We’re big fans of layering sunscreens to ensure you get the best protection possible. As an example, apply facial moisturizer with sunscreen, follow with a primer that contains sunscreen, and finish with a foundation and/or pressed powder that provides additional sun protection. For more tips and sun-smart advice, see our articles “How to Apply Sunscreen” and “How to Have Healthy, Radiant Skin”.